Botanical Name of Devil’s Claw: Harpagophytum procumbens (Burchell). 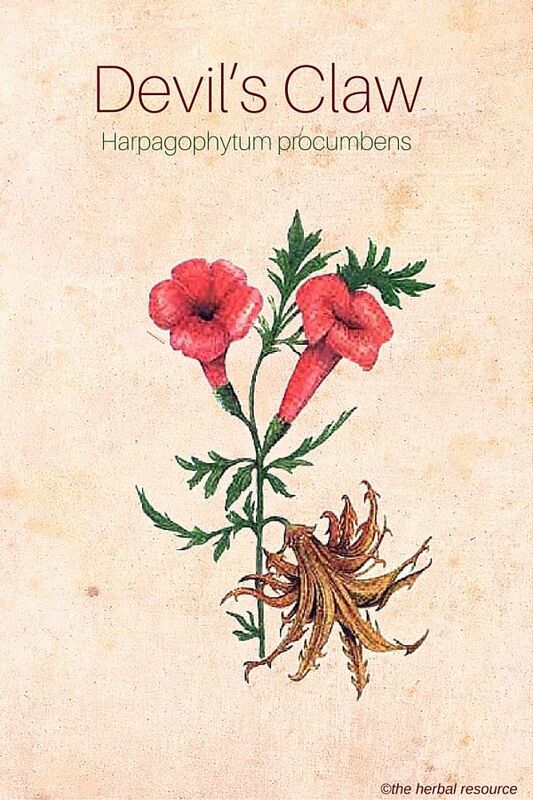 Other Common Names: Grapple plant, harpagon, wood spider. Habitat: The herb devil’s claw is native to southern Africa particularly the Kalahari Desert, Namibia, and Madagascar. Description: Devil’s claw is a perennial plant with tubers and many, round to oval-shaped stems. The leaves have white, hairy undersides. Solitary, red to purple flowers, shaped like trumpets appear in spring followed by the fruit. The name devil’s claw comes from the hooks that cover its fruits. Plant Parts Used: Roots and tuber. The root is collected when the rainy season ends. 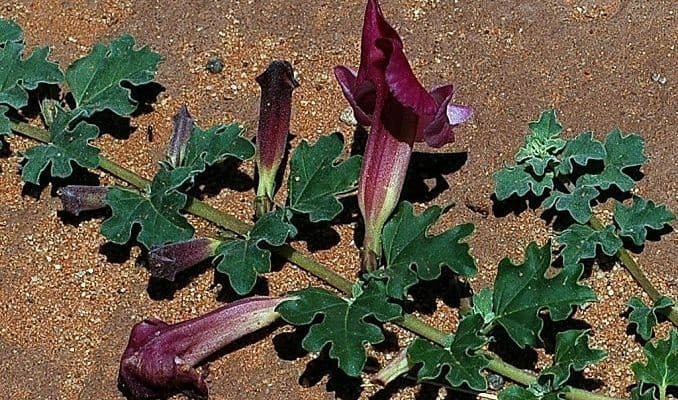 The traditional use of devil’s claw by tribes in Africa involved the root being chopped and dried in the sun for three days to make medicinal preparations. The bitter preparation was used in folk tradition for its analgesic (numbing) and antipyretic (temperature reducing) properties. European colonists took the plant back to their countries where it was used to treat arthritis. The modern-day main use of devil’s claw is as an anti-inflammatory and for pain relief for joint diseases. 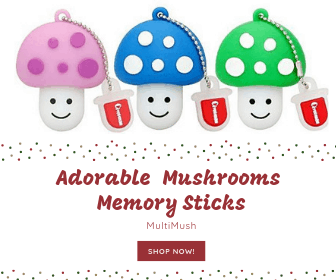 These effects have been proven by laboratory studies. Osteoarthritis or degenerative joint disease is thought to benefit most from the use of devil’s claw. Clinical studies support this and also suggest that it is as effective as some conventional anti-inflammatory drugs. Devil’s claw is also very popular for mild joint pain and back pain is another condition which is thought to be helped by using this herb. One of the traditional uses of devil’s claw is that of an herbal appetite stimulant. Other painful conditions that may benefit from the use of devil’s claw is a headache and general nerve pain. It can also be used as a digestive tonic; the belief is that it helps in the relief of constipation, diarrhea, ulcerative colitis and flatulence. Traditionally, external use of liquid extracts of devil’s claw has been used for sores, ulcers, boils and various skin lesions. Modern day use of devil’s claw is usually though standardized tablets which still contain bitter substances. It is also available as a tincture, liquid extract, and tea. When using commercial products it is important to always read the label and follow the manufacturer’s instruction. It is usually recommended that the herb is taken for at least 2-3 months before any effect may be experienced. The major active ingredient is harpagoside and standardized products can contain anything from 1-8.5% harpagoside. The most likely side effect of devil’s claw is stomach upsets but it has also been reported to cause headaches, ringing in the ears, loss of taste and appetite. People with allergies may react to this herb. It should not be taken by people with gastric or duodenal ulcers and people with gallstones should consult their health providers prior to use. Pregnant and breastfeeding women should not take it. 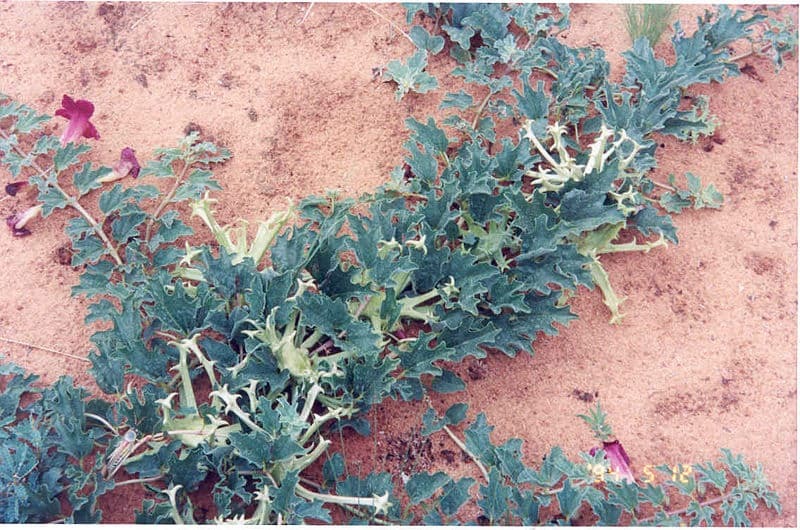 Devil’s claw extracts have theoretically been associated with interactions with blood thinning agents e.g. warfarin, and cardiac drugs so it is important that those that have a history of heart diseases or are taking these drugs should consult a healthcare provider prior to use. Recently diagnosed with moderate osteoarthritis. It is impacting my activity level and I am not getting any relief with OTC pain relievers. I tried this and noticed significant improvement. I became concerned however, about side effects etc. This information was very helpful and answered my questions…Thank you.